What’s the difference, indeed. Honey is most definitely a product of where it’s made. Depending on the nectar the bees collect, honey will vary hugely in flavor and coloring. That’s why you’ll see different flavors (example: Tupelo Honey, Clover Honey) named after the plants the bees visit. According to The National Honey Board, even nectar collected from the same flowers at different blooming times can produce different flavored honey. So I guess there is always a difference when we’re talking honey! 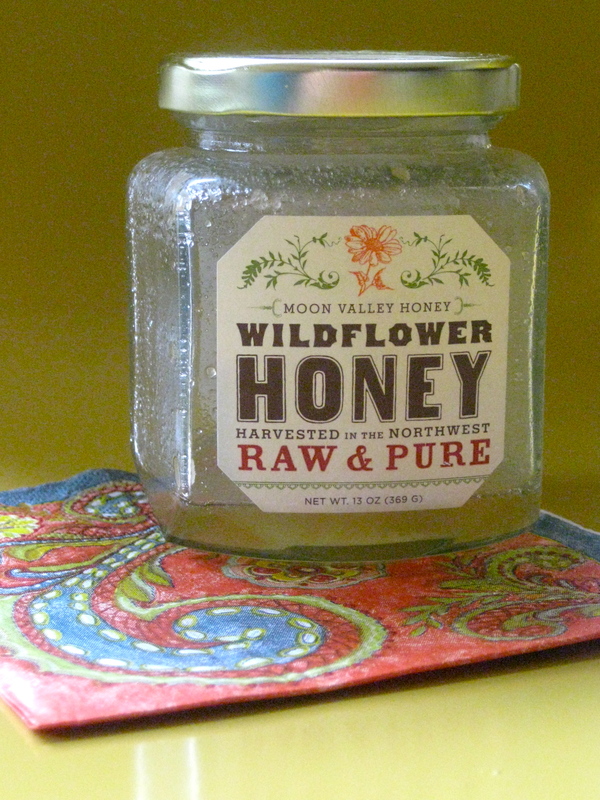 This is from Moon Valley Honey, which is located in the foothills of Washington’s Cascade Mountains. As you can see, all of my honey has been much loved and nearly consumed! You can also see that there is a zip code on the side of the label of the Seattle Urban Honey. This honey came from bees that live just a mile or two from me. Super local! The flavors are definitely different! 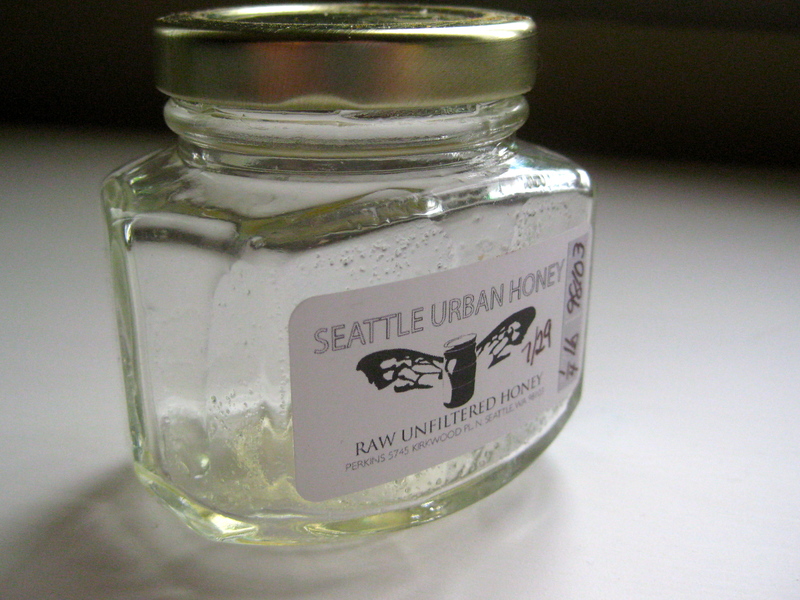 The Seattle Urban honey is more floral, and the color is lighter and clearer. 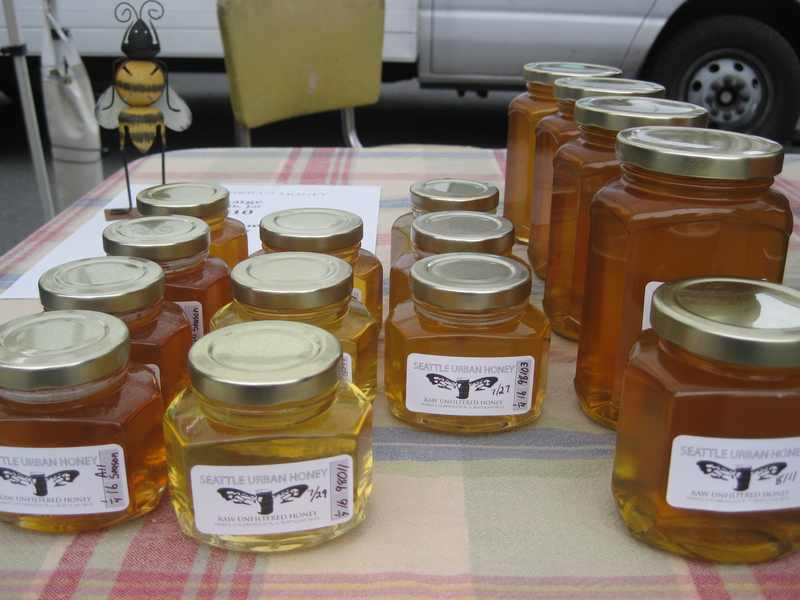 The Moon Valley honey is more buttery, and the color is more golden and opaque. I’m no honey tasting expert, but it’s so interesting to take the time to note the differences brought to us by different plants and animals. Honey aficionados know the importance of location when tasting honey -you can do a honey tasting just like a wine tasting, picking up on the complex flavor notes! There is a lot to learn from the beekeepers -the folks that sell honey can tell you a lot about the flavors to expect in the honey their bees produce. So go local with your honey -it will always be a unique reflection of where you (and those hardworking bees!) live. This entry was posted in In the Pantry (food artisans) and tagged beekeeping, bees, flavors, honey, local food, local honey, nectar, Real Time Farms, wildflower honey. Bookmark the permalink. Local honey (within your own zip code) is amazing for pollen allergies. Eat a tablespoon a day! I really enjoyed reading your article about local honey, particularly learning about how the Seattle honey is so different from the Moon Valley honey. I thought you might be interested in an article I wrote about local honey in Maryland. I focused mostly on the medicinal benefits of honey, but I also interviewed a local bee keeper who clued me in on how some local laws were negatively affecting local bee keepers. Keep up the good work! Great post! Thanks for sharing this Beth! The decline of the honeybees is very disconcerting and I’m so glad you touched on that. Great story – share anything you think would be relevant to our readers – keep it coming!